Back Row(l-r): Debbie Kay, Tammie Beason, Bruce Harper, Mike Hansen, Jack Jones, Dawnette Jolley, Cris Davis, Tamara Quast, Cindy Church, Mr. Heward. Third row: Kim Maier, Kerry Hines, Jeff Holland, Jody Anderson, Marilyn Baumgartner, Steven McDaniel, Chip Jones, Rodney Hansen, Keith Barnes, Robert Murphy. Second Row: Curtis Holmes, Norman Dayley, Janie Harris, Katherine Ringel, Wendy Lambert, Jackie Jonas, Delia Castilla. Front Row: Charles Elliott, Ruben Soto, Mark Bonner, David Hill, Gary Miller, Daniel Green. 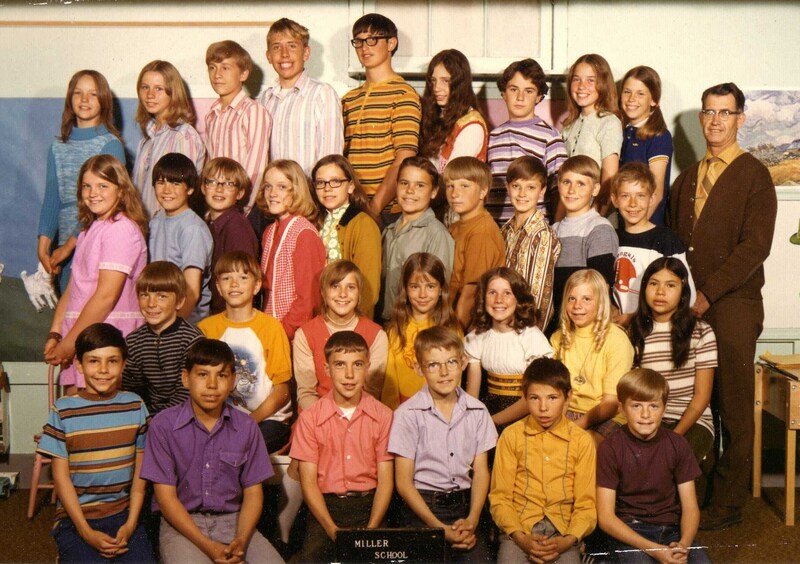 This class photo is one of several in my Aunt’s photos that she gave to me so I could scan them. Since there is not really a great way to keep all the names on the photo with it, I thought this would be the best way. This picture was taken at the old Miller School located in Burley, Cassia, Idaho. I believe this photo was taken in March 1972. Jackie has written on it that she was age 11, and the broader photo has St. Patrick’s Day items on the walls. If anyone has more information about people in the picture, please let me know.